Special Containment Procedures: SCP-1902 is kept in its original location in Site 23's basement level. A fire-resistant concrete containment chamber 3m x 3m in interior size and 1 meter in thickness has been constructed to contain SCP-1902 on-site. The chamber has been constructed to allow for two-way audio and visual communication with SCP-1902. Should containment of SCP-1902 at an alternative location be required, full blueprints and materials lists are available at request from Dr. Hall. No less than one hour of audio recordings are to be prepared and played daily to SCP-1902. The recordings must consist primarily of speech in which the speaker praises or argues in favor of values including moderation, weight loss, humility, and pacifism. Personnel assigned to this task are to be provided access to the entirety of Site 23's declassified audio and video collection for this task. No individual clip of sound may be replayed more than once every three days or more than five times in total. Experiments that deviate from the above protocols require the assent and supervision of Dr. Hall. Tests that involve the addition of unusual material to recordings played to SCP-1902 may not take place more than once every three days. Description: SCP-1902 is a sapient, mobile pile of waste of variable disposition approximately 110 kilograms in mass. 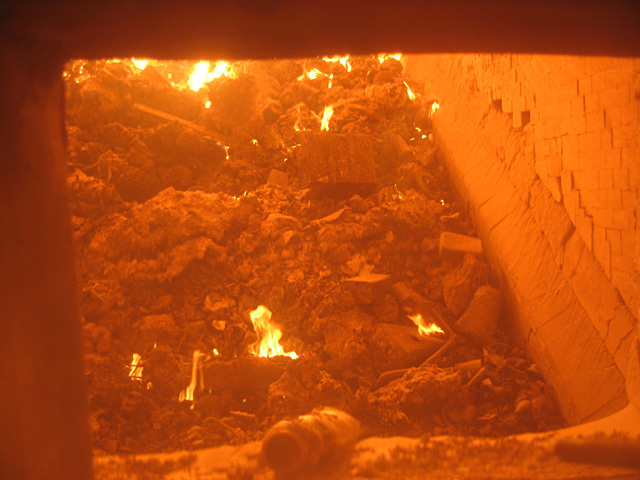 SCP-1902 is composed primarily of ash and cinders, with significant quantities of medical waste, paper products, and various waste products from anomalous items contained at Site 23, along with one item that exhibited anomalous properties prior to incineration (See Addendum 1902-1 and Addendum 1902-2). SCP-1902 possesses well-developed senses of hearing and touch, is incapable of sight, and does not appear to possess an olfaction analogue. SCP-1902 exhibits a great deal of control over its mass (capable of delivering approximately 40kN of force over short periods of time, or 3.0kN of sustained force), with the apparent constraints that at least half of its component items must be in contact with the ground at any one time and that all items in its "body" must remain contiguous with each other. SCP-1902 is able to incorporate items less than 2kg in mass into its body via physical contact, so long as said items are at least partially (>30% of their surface) damaged by fire. Items separated from SCP-1902 cease to display anomalous properties, but may be reincorporated into SCP-1902's mass at a later time. SCP-1902 appears to be influenced almost exclusively by the content of speech conducted in its vicinity within the previous forty hours — while SCP-1902 is capable of learning new information (if not remembering its source), any speech to which it is exposed will have no observable impact on its behavior after forty hours. Additionally, SCP-1902 will habituate to speech that it is exposed to repeatedly — any specific stimulus' impact on SCP-1902's behavior will decrease steadily with exposure, with no apparent change being present after ten exposures to the content of any given speech. Addendum 1902-1: SCP-1902 was recovered from Site 23's solid waste incinerator on February 15, 1966, when the contents of the incinerator spontaneously animated and destroyed both the incinerator and the two attending personnel. Temporary containment measures were enacted before SCP-1902 could cause additional casualties or harm to the facility. Item Description: An antique wooden idol of Ryukyuan origin. The object continuously vibrates and shakes at varying intensity, despite lacking any detectable power source. Current Status: In Site 23's Non-SCP Containment Vault. Slated for incineration.